Brighton Central School District administrators “immediately” called police after finding a “White Student Union” Instagram page on Tuesday which appears to have been created to mirror the school’s formally recognized Black Student Union’s page. 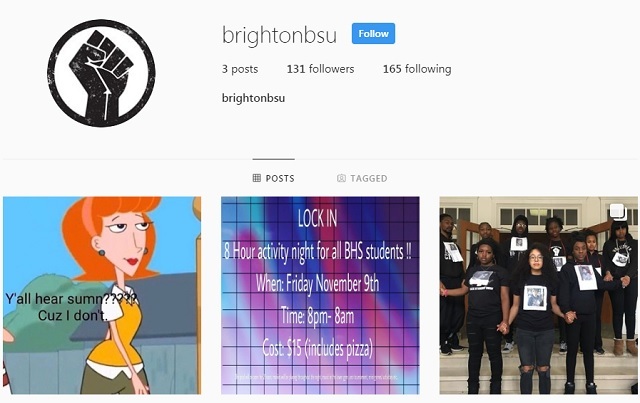 The Brighton Police Department and the Brighton Central School District are investigating an Instagram account supposedly representing a white student union at Brighton High School. Brighton Police Chief Mark Henderson said he believes the school may have an idea of who is behind the account and is trying to learn more about what the intent might be. It’s probably a Nazi conspiracy to overthrow the school district and launch “A Thousand-Year Reich” in its place under supreme leader Ben Shapiro. Better call in the FBI, ATF, DHS and the Coast Guard to get on this case immediately. Dan Goldman, the district’s communications coordinator, said in a statement that the school learned of the account Tuesday evening and immediately notified Brighton Police. Goldman said the account appeared to mirror an account for Brighton High School’s Black Student Union, which is an organization formally recognized by the school. Henderson said the police department is taking the account very seriously, and police are not yet sure if the account is related to stickersrepresenting white nationalist groups that were recently found in Brighton and Pittsford. This reads like a sarcastic joke.